Generations of clinicians have valued Principles of Psychotherapy for its breadth of coverage and accessibility and the author's ability to gather many elements into a unified presentation. The Third Edition presents the conceptual and empirical foundations of evidence-based practice perspectives of psychodynamic theory. It also offers case examples illustrating what a therapist might say and do in various circumstances. In addition, it includes discussion of broader psychodynamic perspectives on short-term therapy. 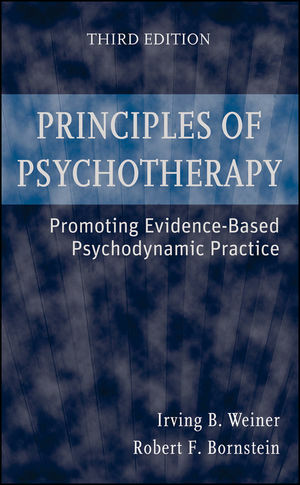 Mental health professionals will benefit from the revised edition s inclusion of empirically based guidelines for conducting effective psychotherapy. Irving B. Weiner, PHD, is Clinical Professor of Psychiatry and Behavioral Medicine at the University of South Florida and former director of Psychological Services at the University of South Florida Psychiatry Center in Tampa, Florida. He is a Fellow of the American Psychological Association and the Association for Psychological Science, and a Diplomate of the American Board of Professional Psychology in both clinical and forensic psychology. Robert F. Bornstein, PHD, is Professor of Psychology in the Derner Institute of Advanced Psychological Studies at Adelphi University. He is a Fellow of the American Psychological Association, Association for Psychological Science, and Society for Personality Assessment; and his research on personality disorders, most recently the dependent personality, has been funded by grants from the National Institute of Mental Health and the National Science Foundation. Chapter 1. The Nature and Goals of Psychotherapy. Chapter 4. Theory Research and Process in Psychotherapy. PART TWO: THE INITIAL PHASE OF PSYCHOTHERAPY. Chapter 5. Evaluation and Assessment. Chapter 6. The Treatment Contract. Chapter 7. Conduct of the Interview. Case Interlude I: Evaluation and Assessment of Ms. A. PART THREE: THE MIDDLE PHASE OF PSYCHOTHERAPY. Chapter 8. Communicating Understanding: Interpretation. Chapter 9. Interference with Communication: Resistance. Chapter 10. The Psychotherapy Relationship: Transference. Chapter 11. The Psychotherapy Relationship: Countertransference. PART FOUR: THE FINAL PHASE OF PSYCHOTHERAPY. Case Interlude-II: Psychotherapy with Ms. A.